VIVA publishing technology, particularly the typesetting and layout program VivaDesigner, is ideally suited for use in clubs and societies. With VivaDesigner you create professional layouts for club/society newspapers, mailings, information sheets, posters and much more. With the Free Edition, your club/society and all members have a free of charge program that runs on all operating systems and is easy to use. By contrast to the free of charge Free Edition, the NGO/NPO* Edition for clubs/societies offers hyphenation, dictionaries, spell checking and a PDF output at a very low price. You can of course exchange documents between the NGO/NPO* Edition and the Free Edition, so that not all members need to buy a license. What makes VivaDesigner different from other programs for clubs and societies? VivaDesigner is a professional typesetting and layout program for all platforms. It is comparable with such programs as “Adobe InDesign®” and “QuarkXPress®” and in some areas offers more functions than these high end DTP programs. In thousands of cases, VivaDesigner is used in the Media sector and by corporations for the creation of professional print documents. VivaDesigner is a “genuine” layout program, not “word processing with layout options”, like “MS-Word®” or “Apple Pages®”. VivaDesigner fulfils all printers’ requirements. Users confirm repeatedly that despite having over 1000 functions, VivaDesigner has a very clear structure and is very easy to use. Furthermore, for professional organisations VivaDesigner offers the additional option of limiting the editing functions of documents. In this way usage becomes so simple that even a layman with basic knowledge of word processing or photo books will find his way around, although he is using a professional layout program. For the layman all the locked functions will be completely switched off and not just grayed out. We call this technology “Distributed Publishing”. 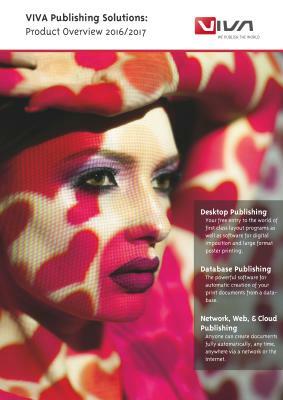 If you want more information about Distributed Publishing with VivaDesigner click here. VivaDesigner is the only commercial high end DTP program to be available not only as a licensed version but also as a full free of charge program version. There are of course other free layout programs, but these frequently do not fulfil the requirements of printers or bind you to one (print) service provider. The licensed version offers all the functions of the commercial full version for a fraction of the price of comparable software. All editions are able to import or open files from other programs such as “Adobe InDesign®” (in IDML format), “MS-Word®” (in RTF format) or “MS-Excel®” (by Drag & Drop). The licensed version is also able to write documents in InDesign format (IDML). Thus you have the surety of being able to import your data into other programs at any time. As far as we know, only VivaDesigner can do this (Status Feb. 2014).